2015 Prestige Football arrives Wednesday with three autographs and one jumbo patch card in every 24-pack hobby box. The rookies get the full-bleed photo treatment with four different parallels - all limited to 100 or less. Each box will contain 24 Rookie Cards, 4 rookie photo variations and a mix of 13 other inserts. For an added Sports Cards Plus BONUS, get one FREE Panini Father's Day Pack with your purchase of 2015 Prestige Football. - Pure Signatures: Featuring Leaf's highly regarded PURE technology. These clear thick glass-like cards feature on-card autographs. Look for parallels as limited as 1/1. - Trinity Patch Autographs: This set has become one of the staples of the draft pick market, featuring player worn patch cards with on-card autographs and parallels as limited as 1/1. - Trinity Signatures: Featuring a sleek and clean design, this set is on-can autographs with many rookies including inscriptions. Parallels as limited as 1/1. Also arriving Wednesday is 2015 Bowman Inception Baseball with FOUR On-Card Autographs and ONE Autographed Relic. Look for an "Inceptioned" version of the players's 2015 Bowman card - one per eight-box case, with parallels including Orange (#d/25), Red (#d/5) and 1/1 Black. New this year will be "Origins" on-card autos of rookies, prospects and veterans, each #d/25 with Red parallels #d/5 and 1/1 Black. Bowman Black Autographs are back and are numbered to 25 with Red parallels #d/5 and 1/1 Black. The Autographed Relic lineup includes Signed Jumbo Patch Relics and Logoman Autos (1/1s). Look for "Letter Book Cards" with a Full Letter Jersey Patch numbered to only two copies per player. Future Stars Game Autographed Relics are 1/1 creations. Look for the 1/1 Autographed Laundry Tag Version. Also look for Quad Auto Relic Books limited to just 10. Not to be outdone, Upper Deck delivers one new product this Wednesday, 2015 Marvel Fleer Retro. The UD Premier Hockey brand returns on JULY 22nd for the first time since 2003-04. 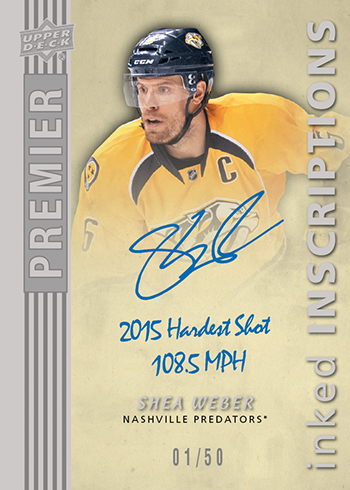 2014-15 UD Premier Hockey features seven high-end cards per tin with one Rookie Auto Patch and four additional Autographs or Relic hits. Look for autographed cards with unique inscriptions in the player own hand. Every tin has one numbered veteran base card and one numbered Rookie base card. Base cards are numbered to 249 with three levels of parallels, Silver Spectrum Jersey #d/149, Gold Spectrum Patch #d/49 and Platinum Blue auto 1/1. Rookie Auto Patch cards are printed on acetate stock and are numbered to 199 or 299, with parallels are numbered to 49 or less. 2014-15 UD Premier also includes veteran players with Acetate Auto Patch cards. UD Premier Mega Patch cards come with monstrous sized patches which nearly take up the entire card. Upper Deck has taken different kinds of patches from game-worn jerseys, including Chest Logos, Sleeve Numbers, Shoulder Logos and Commemorative Logos. Look for Mega Patch Duos (#d/15) with two player patches. 2015 Upper Deck Marvel Fleer Retro arrives Wednesday at Sports Cards Plus. Boxes are divided into two ten-pack mini boxes. 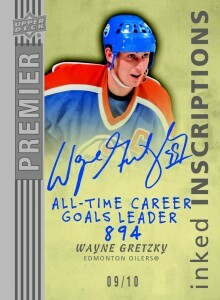 Each master box delivers a sketch card, a Precious Metal Gems insert and four additional premium retro-themed inserts. 2015 Marvel Fleer Retro has a 60-card base set. The base set as well as select inserts have Artist Autograph parallels and Printing Plates. Every pack delivers one basic Retro card, based off 1990 Impel Marvel Universe, the third series of 1992, 1994 Flair and 1995 Marvel Metal Blasters. Each mini box contains two premium Retro inserts from old Marvel sets as well as Fleer sports inserts like the ever-popular Jambalaya. Precious Metal Gems also made the jump to comic trading cards in 2013 Marvel Fleer Retro and quickly became the most popular parts of the product. These brightly colored cards are back in 2015 Marvel Fleer Retro as Blue, Red and Green parallels of the Metal portion of the release. Holograms, once the staple in Marvel trading cards are also randomly inserted.